Imagine if you could spend time at a world-class destination for ecotourism and wellness while supporting the birth of a regenerative civilization on Earth. A consortium of regenerative partners are offering this possibility for you today. 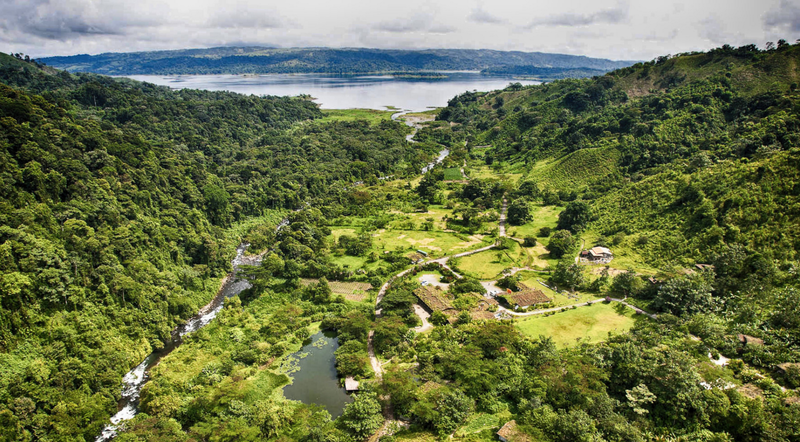 A consortium of partners has gathered around Rancho Margot — an off-the-grid hotel and retreat center in the mountains of the Water and Peace Biosphere Reserve nominated by UNESCO in Northern Costa Rica — to invest in building a network of regenerative projects that will enable us to demonstrate how to grow resilient local wellbeing economies into the 21st Century while allowing the planet to recover its life potential. We invite your participation by offering packages of 60 nights that can be used at any time over the next ten years. These packages are offered at 30% off the 2018 pricing (which means the discount only improves as the rates go up over the next decade). Come for a vacation to observe or be trained for ecosystem regeneration in the education programs that exist, and will be created, at Rancho Margot. You can use the 60 nights any way you like to dip into the community as we learn and evolve along the way. Our only conditions are that the nights are booked as a minimum of 3-night stays; only one bungalow booked at a time; and that they cannot be resold on the market at a later time. You CAN (and are encouraged to) gift an entire package or 3-night blocks to friends and family so that others may experience the magic of Rancho Margot and participate in the growth ahead. Our team will deploy the funds generated to secure a degraded piece of land nearby that will become the first satellite project for regeneration expanding on the practices and principles that are core to ecosystem health in this region. We will carefully document the entire learning process for others to follow. An oversight committee comprised of representatives from our partner organizations will provide transparency, accountability, and expertise to our endeavors. This is a limited time offer. Only 150 packages will be sold, representing 10% of our reservation capacity, so that we remain able to provide excellent services for all our clients. The price for a 60-night discounted stay is $10,000 — meaning we will raise $1.5 million to invest in expanded educational offerings, to secure land for regenerative development at the satellite location, and to continue delivering the experiences that have made Rancho Margot famous throughout the last 15 years. Now imagine the future of universities. No longer will students need to travel far from their homes to secure degrees and find employment in distant places. Entire ecosystems of projects can emerge employing the regenerative principles of healthy economic development. Immersion programs, certification and training programs, emergent new professions, and appropriately interwoven processes for learning and improvement will be needed across entire bioregions. Our vision is to employ the amazing vitality, resiliency, and momentum of Costa Rica as a flagship of instructive development in service to the first bioregional-scale hub of regeneration. You can help fund it by purchasing a package today. With this step, you share in its creation and bring about the opportunity for yourself and others to learn and participate in this effort over the next ten years. Can you imagine this future? Join us now! The best part about this project is who we will work with to manifest it in the coming years. We are already working with several partners to establish “regenerative hubs” for economic development at the scale of entire bioregions. What we’d like to highlight now is how much potential this network represents for creating transformational learning experiences that translate directly into impacts in our projects on the ground. In July of 2018, several regenerative hubs officially launched at a highly impactful meeting that was held at Rancho Margot. The organizations in the graphic were participants in that meeting — each of whom has made commitments to the shared vision of regeneration across Costa Rica. You can read about this larger body of work here. A key partner is Universidad para la Cooperación Internacional, founded by Eduard Müller with a mission to create the field of regenerative development. In its early days, UCI produced innovative graduate programs for project management in sustainability and has pioneered the realm of biosphere reserves and the management of protected areas. We will work with UCI to offer integrative programs that combine online distance learning with immersion experiences and project-based learning. An effort is already underway to design a program in regenerative development for adult practitioners that will offer workshops, certified trainer programs, and internships to students who join our projects. Capital Institute has emerged as a provocative new voice grounded in a deep understanding of mainstream finance. They are a sought-after and trusted New Economy resource, committed equally to groundbreaking thought leadership, deep analysis of successful and transformative Regenerative Economy models, and the collaborative sharing of knowledge with partners and an expanding community around the world. Capital institute has a leading role in the establishment of regenerative hubs around the world, which will work in close collaboration with other hubs through the Regenerative Communities Network. Savory Institute has shown the way to promote large-scale restoration of the world’s grasslands through holistic management and become a key solution to bring the atmospheric CO2 levels back to those predominant over the last million years. Savory Institute facilitates the realization of a life of enduring returns for the land and all who depend on it. Another key partner is Gaia Education, which has developed curricula for sustainable communities as part of the Global Ecovillage Network. We are working with their curriculum creators to prototype a course on bioregional design that can be replicated in other parts of the world. We envision Rancho Margot as a catalyst among transformational endeavors. Through the synergies among projects it is our hope to show the world how bioregional development can offer a paradigmatic way to guide humanity and the Earth toward planetary health. Here are some articles by our partners that outline what we are part of and striving to do together. Additional Note: I am part of the team managing this effort at Rancho Margot. Please feel encouraged to reach out to me directly if you have questions and are interested in getting more involved.